............Two recent drawing showing the always dreaded foreshortening. 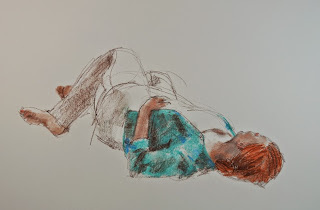 The girl in teal shows foreshortening of most of the figure....not severely so, but enough to be challenging. The girl in red just has her left arm foreshortened but it was fairly severe. On both of these, I basically drew it as I saw it. On the girl in red, I exaggerated the hand a bit to make it appear that it was closer to the viewer...which it is by the way but I like the idea of just slightly exaggerating it. Both drawings approx 15 minutes, conte and pastel. Both available.